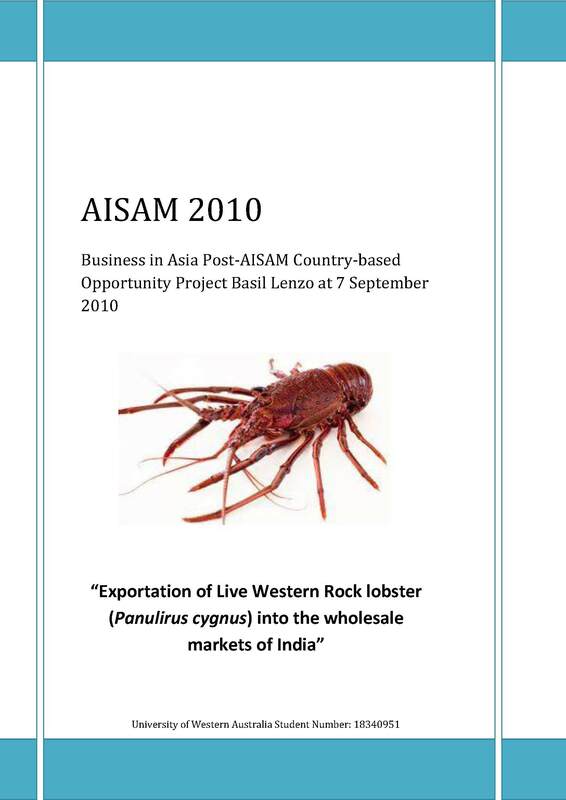 The objective of this report was to ascertain the feasibility for the Geraldton Fishermen‟s Co-operative (GFC) to export Western Australian Western Rock Lobsters (Panulirus cygnus) into the new and emerging market opportunities of India at a comparative price premium when benchmarked against other Asian nations such as China (presently Australia‟s largest Lobster customer). In order to pursue a competitive advantage in this emerging market, it is proposed the company adopt a "first-mover" strategy. This is based on the findings within the preliminary report that indicates that a majority of the qualitative and quantitative factors such as population demographics, logistics, government political and legal policies such as bilateral trade agreements and language barriers were at least as favourable to export to India as other existing Asian customers. That said, less definable qualitative factors such as culture, religion and ultimately consumer acceptance not only of an imported product but more importantly the willingness to pay a „price premium‟ similar to Asian competitors such as China and Japan can only be gauged by testing the market.